This article is about steam-powered road rollers. For informal use of the term that also includes other types, see road roller. For all other uses, see Steamroller (disambiguation). Steamroller by Aveling and Porter from early 20th century. On display at the Gangaramaya Temple in Colombo. Front view of Aveling and Porter steamroller at the Gangaramaya Temple in Colombo. A steamroller (or steam roller) is a form of road roller – a type of heavy construction machinery used for leveling surfaces, such as roads or airfields – that is powered by a steam engine. The levelling/flattening action is achieved through a combination of the size and weight of the vehicle and the rolls: the smooth wheels and the large cylinder or drum fitted in place of treaded road wheels. The majority of steam rollers are outwardly similar to traction engines as many traction engine manufacturers later produced rollers based on their existing designs, and the patents owned by certain roller manufacturers tended to influence the general arrangements used by others. The key difference between the two vehicles is that on a roller the main roll replaces the front wheels and axle that would be fitted to a traction engine. The word steamroller is frequently used to refer to road rollers in general, regardless of the method of propulsion. Aveling & Porter manufactured the first successful steamrollers. Pictured, is the model "Britannia". Before about 1850, the word steamroller meant a fixed machine for rolling and curving steel plates for boilers and ships. From then on, it also meant a vehicle. An early steamroller was demonstrated by Louis Lemoine in France in 1860 and in Britain in 1863 by William Clark and partner W.F. Batho. The company Aveling & Porter was the first to successfully sell the product commercially and subsequently became the largest manufacturer in the world. In 1866 they produced a prototype roller with 3 foot-wide rollers fitted to the rear of a standard 12 nominal horsepower traction engine. This experimental machine was described by local papers as 'the world's first steamroller' and it caused a public spectacle. In 1867 the steam road roller was patented and the company began production of the first practical steam roller - the new machine's rollers were mounted at the front instead of the back and it weighed in excess of 30 tons. It was tested on the Military Road in Chatham, Star Hill in Rochester and in Hyde Park, London and the machine proved a huge success. Within a year, they were being exported around the world, including to France, India and the United States. A New York City chief engineer said of one of these, that "in one day's rolling at a cost of 10 dollars, as much work was accomplished as in two days' rolling with a 7 ton roller drawn by eight horses at a cost of 20 dollars a day." Aveling & Porter refined their product continuously over the following decades, introducing fully steerable front rollers and compound steam engines at the 1881 Royal Agricultural Show. The majority of rollers were of the same basic 3-roll configuration, gear-driven, with two large smooth wheels (rolls) at the back and a single wide roll at the front. (Actually, the wide roll usually comprised two narrower rolls on the same axle, to make steering easier.) However, there was also a distinctive variant, the "tandem", which had two wide rolls, one front, one rear. Those made by Robey & Co. used their standard steam wagon engine and pistol boiler fitted in a girder frame with rolls and a chain drive to produce a quick-reversing roller suitable for modern road surfaces such as tarmacadam and bituminous asphalt. A number of Robey & Co. tandem rollers were modified to make a further variant, the tri-tandem, which was a tandem with a third roll, mounted directly behind the rear one. Robey supplied the parts, but the modification was undertaken by Goodes of Royston. Ten tandem and two tri-tandem Robey rollers survive in preservation, and one of the tri-tandems is known to have been used to construct parts of the M1 motorway. A variation of the basic configuration was the "convertible": an engine which could be either a steam roller or a traction engine and could be changed from one form to the other in a relatively short time – i.e., less than half a day. Convertible engines were liked by local authorities, since the same machine could be used for haulage in the winter and road-mending in the summer. Although most steam roller designs are derived from traction engines, and were manufactured by the same companies, there are a number of features that set them apart. The most obvious difference is in the wheels. Traction engines were generally built with large fabricated spoked steel wheels with wide rims. Those intended for road use would have continuous solid rubber tyres bolted around the rims, to improve traction on tarmac. Engines intended for agricultural use would have a series of strakes bolted diagonally across the rims, like the tread on a modern pneumatic tractor tyre, and the wheels were typically wider to spread the load more evenly. Steam rollers, on the other hand, had smooth rear wheels and a roller at the front. The roller consisted of a pair of adjacent wide cylinders supported at both ends. This replaced the separate wheels and axle of a traction engine. In the conventional arrangement, the front roller is mounted centrally, forward of the chimney. In order to allow enough clearance from the boiler (and hence a larger front roll), the smokebox is extended forward substantially at the top to incorporate a support plate on which to mount the bearing for the roller assembly. This gives the distinctive, hooded look to the front of a steam roller. It also necessitates a different design of smokebox door – it has to hinge up or down, rather than opening sideways, due to the limited access available. Access to the boiler tubes for cleaning is limited and the brush usually has to be inserted through the small gap between the top of the roll and the fork. The front and rear rolls were usually fitted with scraper bars. As the vehicle moved along, these removed any surface material that had become stuck to the roll, to prevent a build-up of material and ensure a flat finish was maintained. Some steam rollers were fitted with a scarifier mounted on the tender box at the rear. They could be swung down to road level and used to rip up the old surface before a road was remade. Another accessory was a tar sprayer – a bar mounted on the back of the roller. This was not a common fixture. Britain was a large exporter of steam rollers to the world over the years, with the firm of Aveling and Porter probably being the most famous and the most prolific. Many other traction engine manufacturers built steam rollers, but after Aveling and Porter, the most popular were Marshall, Sons & Co., John Fowler & Co., and Wallis & Steevens. In America, the Buffalo-Springfield Roller Company was a large builder. J. I. Case made a roller variant of their famed farm engines, but had a small market share. Other nations had makers including the Czechs, Swiss, Swedes, Germans and Dutch which produced steam rollers. United States -built 1924 Buffalo Springfield steam roller: a vertical boiler design with tandem rolls. Note position of firebox door, facing out of frames. In the UK, a number of companies owned fleets of steam rollers and contracted them out to local authorities. Many were still in use into the 1960s, and part of the M1 motorway was made with the help of steam rollers. A few steam rollers were still being used for road maintenance in the early 1970s, and this may go some way to explaining why diesel-powered rollers are still colloquially known as steam rollers to this day. 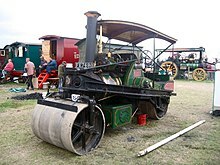 Many steam rollers are preserved in working order, and can be seen in operation during special live steam festivals, where operating scale models may also be displayed. At some of the UK steam fairs and rallies, demonstrations of road building using the old techniques, tools and machines are re-enacted by 'Road Gangs' in authentic dress; steam rollers feature prominently in these demonstrations. The annual Great Dorset Steam Fair has a section dedicated to road-making machinery, including a line-up of working steam rollers. British steeplejack and engineering enthusiast Fred Dibnah was known as a national institution in Great Britain for the conservation of steam rollers and traction engines. The first engine he restored to working order was an Aveling & Porter steam roller, registration no. DM3079. Built in 1912, it was a 10-ton slide-valve, single-cylinder, 4-shaft, road roller. Originally named "Allison", after his first wife, Fred renamed the engine "Betsy" (his mother's name) following his divorce – Fred's view being "wives may change but your mother remains your mother!" This roller was featured in many of Fred's early television programmes. It may still be seen at steam rallies in Britain and was in steam at the Great Dorset Steam Fair in 2011. The 1934 short film Mickey's Steam Roller involves a steamroller hijacking by Mickey Mouse's nephews which leads to devastating but non-lethal results. A steam roller was part of the supporting cast in the 1953 British film The Titfield Thunderbolt, which encountered a GWR tank locomotive in the film. In the 1971 film Dad's Army, the Walmington-on-Sea platoon is sent on an exercise for Home Guard training. On the way, an incident that disables Jones's van results in Capt. Mainwaring commandeering a passing steam roller to tow the van to the exercise. Unfortunately, on arrival at the training camp, Mainwaring and Jones discover that neither knows how to stop the roller, and they end up flattening their tents and equipment. In 'Allo 'Allo!, in one episode (Series 3 episode 4, "Flight Of Fancy"), Colonel Kurt Von Strohm and Captain Hans Geering drive a steamroller to infiltrate an old railway parade but find they cannot stop and accidentally run over and crush Herr Flick's Gestapo staff car. Several characters in children's popular fiction have been based on steam rollers. George the Steamroller appears in the Rev W. Awdry's Railway Series books and also in Thomas the Tank Engine and Friends, the TV adaptation. Buster the Steamroller, a member of the Sodor Construction Company, has also appeared in the TV series. Roley is one of the main vehicle characters in the children's television series Bob the Builder. He is a green road roller with a cab, enclosed power unit and no chimney, and so is obviously diesel-powered – nevertheless, his official title is Roley the Steamroller. This is an example of how use of the term "steam roller" to describe a modern road roller still persists in the English language. Steam rollers have had an influence on popular music, for example, the group Buffalo Springfield named themselves after (the manufacturer of) a steam roller parked outside the house. The song Steamroller Blues was written and performed by James Taylor in 1970 and subsequently became a favourite of live concerts by Elvis Presley. Verdi's Il Trovatore Anvil Chorus is associated with steamrolling and power in some parts of the world. The name of American music group Mannheim Steamroller is the result of blending the word "steamroller" with "Mannheim roller", an 18th-century German musical technique characterized by a crescendo passage having a rising melodic line over an ostinato bass line, popularized by the Mannheim school of composition. See also Steam (Peter Gabriel song). Also, the name of ex-Yugoslav and Croatian rock band Parni Valjak means "steamroller". Paddy's motorbike – nickname for another type of compaction vehicle. Thomas Green & Son builders of steam rollers, but better known for motor rollers. ^ "Definition of Steamroller". www.merriam-webster.com. Retrieved 2 March 2019. ^ "Steam Rollers in Britain". Farm Collector. May 1990. ^ "Steam Road Rollers (Gallery)". Bedfordshire Steam & Country Fair 2005. Bedford Steam Engine Preservation Society. Retrieved 8 February 2007. Wikimedia Commons has media related to Steam rollers. Road Roller Association – UK-based society dedicated to the preservation of steam (and motor) rollers and ancillary road-making equipment. "Steam Dinosaur" – world's oldest surviving traction engine: immediate ancestor of Aveling's earliest rollers. This page was last edited on 2 March 2019, at 06:10 (UTC).